This quote is taped to my desk at work – at eye level. I see it every day, and every day I think to myself, ‘How true.” Or mostly true, for me. Robert and I differ in the ‘not to go anywhere’ part, because I often travel to specifically go somewhere, but like R.L.S., I also travel just to move. Moving, going, leaving, arriving, this global kinetic energy that I partake of and contribute to, is part of my internal rhythm. And this type of energy is heightened in a particular kind of travel: The Road Trip. R.L.S. died in 1894, so it is safe to say that he never went on a road trip. Not really. Not the kind we take today, in cars, and on actual roads. He never knew the pleasure hitting the open road, with plans and expectations crammed in the mind, like the maps and brochures are crammed into the glove box. But, as I climbed into a hire car in San Francisco earlier this week, I knew he would have approved. After all, ‘…the great affair is to move’, and the first leg of my trip with Ben, was the same trip Stevenson shared with his new bride in 1880: a journey north to the Napa Valley. San Francisco is nothing like I imagined, basing my extensive expectations on remembered episodes of Full House and Party of Five, but it did not disappoint. In fact, our 44 hour stint there, our taster of a great city to which we will someday return, was so full that it is a whole post of its own. Soon. I promise. This journey starts in SanFran, and ends in Seattle. It encompasses the Napa Valley, the northern Californian coast, Oregon’s coast, Portland, Oregon’s capital, and everywhere in between. 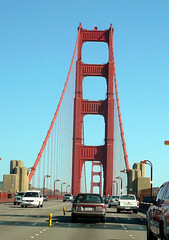 Crossing the Golden Gate Bridge is cool. It is huge and iconic and brightly burnt orange, and crossing it for the first time means, “I have been to San Francisco.” Even though Ben and I had been traversing the streets of the city for two days, this was the moment when it sank in that I was actually there – and we were leaving. The drive to Napa Valley is just over an hour. This is not a long drive, unless you are dying to pee and arrive in Yountville. 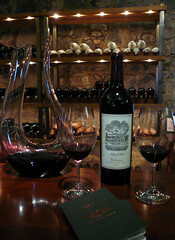 Yountville is one of many small towns dotted along Highway 29, and is just north of Napa. It is beautiful and pristine and apparently people who visit have no bathroom needs (there are no public toilets). After an excruciating reconnaissance of the town, which oddly was shut at 10:30 in the morning, I hobbled to a roadside porta potty. Back in the car, my mood lifted (Ben is a master of patiently bearing the desperate cries and angry rants that accompany this state of being), and we drove on to Chandon Estate. Chandon sparkling white is a staple for me and my friends when we attend the horseracing carnivals in Sydney, so I was looking forward to visiting the Napa estate. The grounds and building were beautifully situated, and there was a reverent hush in the air. We were directed to a tasting bar, and Ben ordered a flight of wines – three half flutes, each wine distinctive and delicious (offered sips were gratefully accepted). I ordered a sparkling rose, just released, and drank slowly as I drank in my surroundings. It was a perfect California day: cloudless blue skies and 26°. We drove on. I had done my homework and knew I wanted to go to Rubicon Estate, not far to the north. I could not remember why my reading had triggered this desire, until we pulled into the grand gates of Rubicon, valeted the car and walked up the steps onto a red carpet. “Ah, yes,” I said, “now I remember,” a large sign jogging my memory. The estate is owned by Francis Ford Coppola, and it is majestic. A $25 fee would buy us a three-day passport, which included 5 tastings, tours and, well, just being there. An orientation tour fed us the history of Rubicon, which was once owned by a Russian visionary called Niebaum. Niebaum envisioned the tasting rooms and cellar door culture that is now ubiquitous in wine regions worldwide. 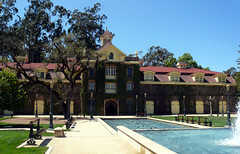 He produced exceptional wines, which were served exclusively at the White House and on exclusive trans-Atlantic cruises. 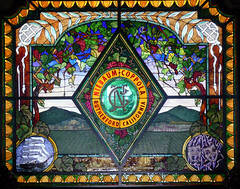 In purchasing the winery and making vast, restorative improvements, Coppola has paid homage to its history and has restored its wine-making prestige. We tasted a flight of five wines, including a Sauvignon Blanc and a Syrah, and culminating in the 2004 Rubicon. The first three wines are only available at the cellar door, and Ben bought a bottle of the Syrah – it is outstanding. We would love to have bought a bottle of the Rubicon, but at $125, it is a little out of our price range. We enjoyed the ambiance and the banter with the older gentleman pouring our wine, and bid farewell to Rubicon, glad we had made the pilgrimage there. 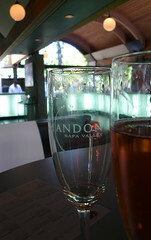 We back tracked to Yountville; we knew there were many choices for lunch, having done our ‘reckie’ hours earlier. We ate at Bistro Jeanty, a French style Bistro on the main street. The food was prompt, and tasty, although I burned my mouth on the excruciatingly hot French onion soup. It made me a little grumpy, because how do you taste wine when your taste buds have been seared off? 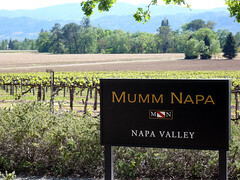 I downed healing water as we drove on to Mumm. Mmm, Mumm. 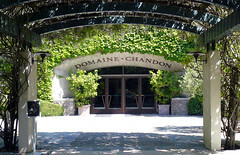 We were greeted by a warm woman, who put the officious staff at Chandon to shame. We seated ourselves on the patio overlooking the vineyard, and I presented a 2 for 1 coupon I downloaded from the net (wine tasting in Napa can be pricey). Our hostess brought us two flutes of yumm, I mean, Mumm. “Hey,” she said, conspiratorially, “would you like to try our signature pour? While we’re not busy.” She brought us a taste of DVX, nearly full flutes and we sipped that along with our Blanc de Noir. Both delicious, but sipping and sitting in the sun was going to my head. Ben took his tiddly girl back to the car, and we drove on to St. Helena, where we would stay that night in a B+B. We arrived at 4, after a day of sun, sips and sighs of pleasure. Ahhh, Napa. St Helena to the land of the giants.